The world needs more magicians like Baltazar Fuentes. Fluid, smooth, understated, and clean. In the right circles, the name Baltazar Fuentes comes up a lot (mostly because of his Revolution Pass, which is also featured on this DVD). He chilled with Marlo and has sessioned with all the big guys. And if you go to Mexico, he is “the” guy to meet. But how do the rest of us access his magic? For years, the only way was to obtain two hard-to-find and, frankly, frustrating lecture notes. The items featured inside were great (many of them are collected on this DVD), but without enough photos or details, we could only imagine what this stuff is supposed to look like. I’m glad Baltazar is releasing a DVD, because he is the kind of performer who deserves to be seen and not just read. He has a great pair of hands and his style is a mixture of classical old-school elegance and a quirky, creative flair. The matrix routine he performs here, invented by Fenik, is terrific. Now let’s come back to the Revolutionary Pass for a second. In the video demo this looks a bit like the Midnight Shift or a Hermann style pass. Not so. For those of us who collect moves that are as fun to learn and practice as they are to perform, this pass is a must-have. SO MUCH is going on behind the hands, and it FEELS SO GOOD to execute this shift. 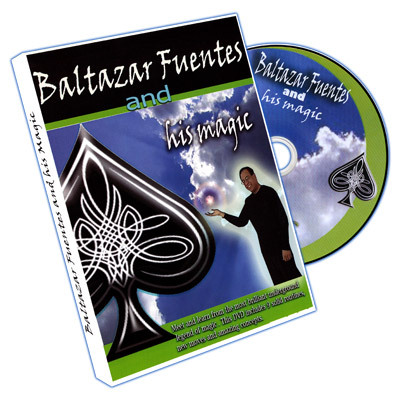 The other thing we like about this DVD is the variety of material: you get the card material Baltazar is known for, but I was surprised that he also performs magic with balls, rope, coins, and other items. It’s a good value, and a better resource than his scarce lecture booklets. 3.0 Balls - Three Little Balls Travel Across, plus more. Ring And Rope – A classical routine with a visual moment you’ve never seen before—the ring goes VISUALLY through the rope. Coins Thru Table - End Your "Coins Thru Table" Routine With Baltazar's Imp Pass. The Matrix Strikes Back – Fenik invented this matrix sequence years ago, but it stands the test of time. Revolutionary Pass – This is it! One of the finest underground shifts ever devised, released for the first time. Disention Aces - The Aces Penetrate Through The Deck Of Cards. Baltazar's Turnover Pass - This Turnover Pass Is Easy And Practical. Matrix 2 - There are lots of weird matrix endings these days, but this one is surprising, logical, and practical. Coins And Purse – A beautiful and classical coin routine sure to please even the most discriminating coin magician. Upright Change – This color change happens with the pack held VERTICALLY. Phantom Kings – An Ambidextrous Travelers sort of routine, with some beautiful touches. A great dvd full of particle magic! Glad to have it in my collection!